The Chuquicamata mine has helped Codelco dominate the copper market as the world’s number one producer of the metal. Now, the state-owned company is at risk of losing that title. The vast pit known locally as "Chuqui" is being shut, replaced by an underground mine that will take five years to reach its full output of about 300,000 tons of copper a year. Company officials, meanwhile, remain confident that the Chuquicamata transition and other projects will allow it to maintain its output. "It’s looking increasingly like Codelco might be a 1-million ton producer and not the two million tons that they’ve always promised," said Colin Hamilton, managing director for commodities at BMO Capital Markets. "The potential impact on the future copper market is still underappreciated, but is now so pertinent that it simply cannot be ignored." For Chile, falling production could mean less income from what has long been one of the state’s premier cash cows. The company has already seen some pullback: In 2018, Codelco’s output from mines it operates in Chile fell 3.3 percent to 1.68 million tons. In February, Codelco’s monthly production fell to the lowest level in eight years after heavy rains in northern Chile impacted operations at the northern division, which includes Chuquicamata. Another unexpected setback was the delay in completing work at two of its four smelters, which have been shut since December. Codelco had to invest $2.15 billion to upgrade smelters to comply with new emissions standards that kicked in last year. While the company has stepped up investment in its ongoing projects, the budget and time line for several of them have slipped over the years. 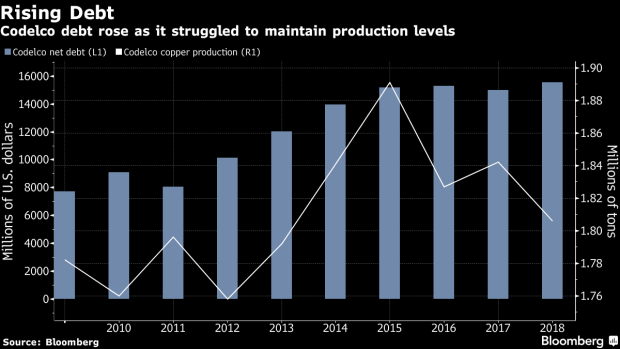 Codelco says it can avoid a slump in production and keep copper output at current levels if it invests over $20 billion in upgrading its mines, some of them more than 100 years old. But that could be an increasingly challenging task, with government funding secured only until 2020 and current debt levels at a record high of $15.5 billion. The Codelco chairman, Juan Benavides, sees a glass half full. "The projects are on track and Codelco’s production is forecast to remain at current levels," he said in an interview in Santiago last week. "The start of the underground mine will coincide with the end of the open pit and that will allow us to maintain and even raise slightly production at the mine" once it’s fully in operation. Codelco’s output decline in Chile last year was slightly offset by higher production at mines owned jointly with Freeport-McMoRan Inc. and Anglo American Plc, which brought total output to 1.8 million tons. Its rivals, however, aren’t far away from claiming the title as the world’s biggest copper producer: BHP Billiton Ltd. produced 1.75 million tons in its last financial year. Worries about Codelco’s future have become a recurring theme in the copper industry. A decade ago, former CEO Diego Hernandez talked of "refounding" the company, which was formed in the nationalization of the Chilean copper industry in the 1970s. The Santiago-based company is well financed this year and next after receiving a $400 million funding package from the government, and placing a $1.5 billion bond in February, according to Benavides. It won’t issue more debt in 2019, and will wait until 2020 to negotiate with the government funding beyond 2021. "We will see what happens on a year-by-year basis,” Benavides said. Codelco gives all of its profit to the Chilean state and it needs the government to hand some of it back to continue investing in its projects. Lack of funding would result in the company’s debt soaring to as much as $21 billion, or it would mean that projects must be delayed, Chief Executive Officer Nelson Pizarro said last month. Funding from the government isn’t guaranteed. In 2013, the company got nothing. In 2010, the government gave Codelco just $7 million and in 2006 it received $11 million. The current government, which has a minority in congress, has said it needs to pass its tax reform bill first. "If you look at Codelco’s production, it does require that some of the structural investment projects come into production," said Ivan Arriagada, Chief Executive Officer at Antofagasta Plc and former vice president of finance at Codelco. Given past delays in these projects, "unless there are alternative sources of production which have been identified, the ability to keep producing at 1.7 million tons per year becomes more of a challenge until those projects come on stream."